Introductory lab on circuits and how light bulbs work. 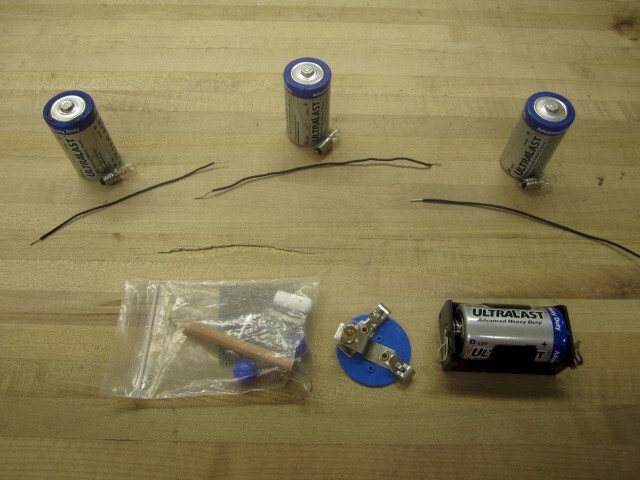 Place one battery, light bulb, and wire in front of each seat. Leave the battery in the battery holder, light bulb in the light bulb holder, and bag of assorted objects one the end (or somewhere out of the way) of each desk. Place container containing large light bulbs with the base cut open on the front table (at least 10 so each group will have one to use, having additional bulbs available is ideal). Along with the initial apparatus set-up, supply a sufficient number of the appropriate paper procedure handouts for all of the lab sections that will use the set-up over the course of the week. Print the PDF, duplicate to double-sided pages, staple, and leave pile on instructor's table prior to first use of set-up. Item modified on 2017-09-20 12:04:04 by preisingc1.